This past week, and for the next two, our family is hosting John from China. He’s 13 and we all call him John because who really wants to spend 3 weeks listening to Canadians struggle with your name and butcher it in the process? So this week’s nominees are all set in the Red Dragon. I know they’re all fighting movies, but so are the other possibilities frankly. At least theirs don’t center around guns though, right? Which do you think should be our movie of the week? As a teenager I would tell everyone I wanted to be an actor yet I’d never tried out for any play or musical. Not even in junior high school. Not elementary either. So, after getting an encouraging pep talk from a math teacher I decided to try out for one in my last year of school. I was excited that I’d gotten a part. And it was second from the top of the list posted on the hallway wall! Turned out though that it was a cast of about a dozen teens with me having the fewest lines and appearing in only one scene. Still, I was excited to be a part of it. It was called “And Then There Were None,” which was based on an Agatha Christie mystery novel from 1939. I really looked up to my fellow actors. They all seemed so confident and fearless in both their acting and in their social interaction. At practices I would think about how I had the fewest lines and wondered at what that meant. It didn’t mean a thing, but I was young as well as both nervous and awkward about how I appeared to others. Then at the final performance of the play, I walked out on stage with my fellow cast members and we all took a bow. When we walked back, it was Kevin who picked me up. He played the military man in the play; a very significant role with a ton of lines. He was celebrating. Whenever a cast has finished a play or musical there is a euphoria that comes over those involved much like a sports team that just won a tournament. He picked me up in a big bear hug, whooped and hollered, and the others crowded around us doing the same. I’d wondered if he chose me deliberately or if I just happened to be the nearest person who he felt he could lift up in the air. Was he pitying me for having such a minor role? Though these thoughts swirled around my head, they were muted. A much stronger sense of accomplishment, camaraderie, joy, and a deep gratitude to Kevin and my fellow cast members for including me, even embracing me, in this venture. I will never forget that moment. Thank you Kevin. Wish you were here. 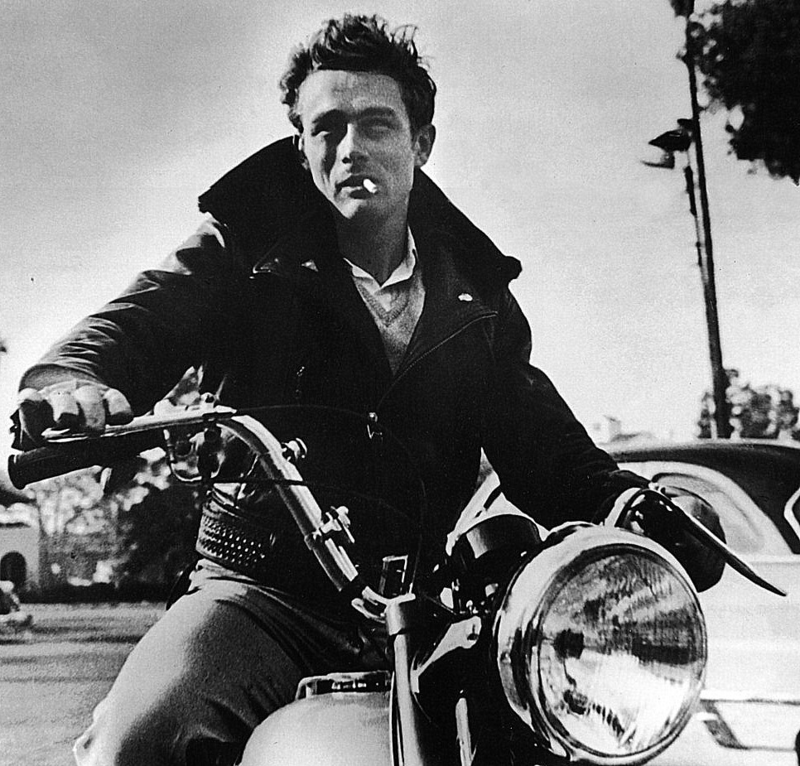 Congratulations Rebel Without a Cause. This is your week. Best Actress: Rachel McAdams as Regina George in Mean Girls. Best Actor: Anthony Michael Hall as Brian Johnson in The Breakfast Club. Summers often remind me of my teen years. 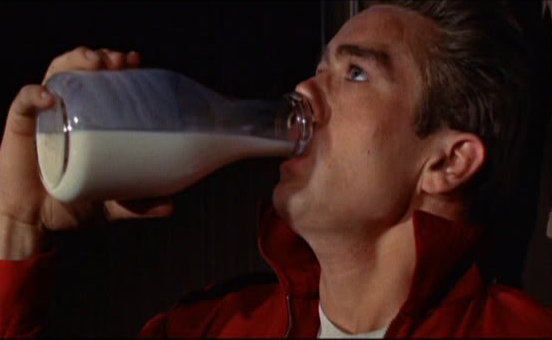 This week we chose from 4 iconic teen movies. Which one would you pick as Movie of the Week? What about the other kinds of cancer? There are people suffering from cancers that affect any one or more parts of their body and here we are picking one out of the bag and giving it our money. It seems that lung cancer just isn’t popular enough to raise the kind of money breast cancer raises. What about the other kinds of diseases? People die every day from thousands of diseases—I refuse to choose one and give it attention as if it’s more important than the others. What about men? I realize that 1 out of 9 women will be diagnosed with breast cancer (according to the Canadian Breast Cancer Foundation anyway), but women only take up half the population on this planet (I’ve heard that women outnumber men in world population, but I seriously question that claim). Men get testicular cancer, but it doesn’t get the attention that breast cancer does. Does that sound right to you? Sounds like reverse sexism to me! The “pink” is getting obnoxious. I’ve seen pink ribbons, pink shirts, pink busses… even the ring ropes on WWE Monday Night Raw turn pink each year for breast cancer. I think it’s overkill, and none of the other diseases get this kind of attention. In fact, I’m a little concerned that people will get turned off of supporting breast cancer since its supporters are so in-your-face about it. Now if you are reading this and you completely disagree and are appalled by the above statements, good. I hope you never hold to such drivel. And I trust you will also not adhere to the sentiment implied in the statement “All lives matter” in response to the Black Lives Matter movement. And if you’d like to donate or find out how to get involved in supporting breast cancer research, click here. Congratulations Stranger Than Fiction. This is your week. Best Actress: Emma Thompson as Karen Eiffel in Stranger Than Fiction. Best Actor: Other than Will, I really think Paul Rudd deserves this award. 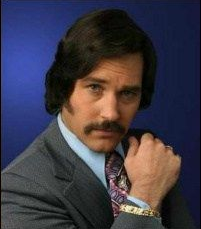 I think he’s hilarious, but I also think he’s at his very funniest in Anchorman. Best Quote: I do love Jamie’s contribution: “Well let me just quote the late-great Colonel Sanders, who said…”I’m too drunk to taste this chicken.” — Talladega Nights: The Ballad of Ricky Bobby. For the record: I don’t believe all American police officers (not even a small majority) are racist and/or unnecessarily violent. But there is undeniably a problem. And when a large group of people are crying out that they are being unfairly treated, the very least we can do as fellow human beings is to listen. If you’re unsure of the claims of the BLM activists, consider anti-racism educator Jane Elliott’s challenge. She asks her audience of white people to raise their hands if any of them would be willing to be treated as “our society in general” treats people with dark skin. No one ever raises their hand. And we here in Canada are in the very same boat. Indigenous lives matter too. Do we listen? For the last 25 years the one actor who I think was able to capture the hearts and laughs of the most people would be Will Ferrell. The following are my favourite movies of his, aside from Elf (2003), which I left out because it would be too easy of a win. Which one should be our movie of the week? 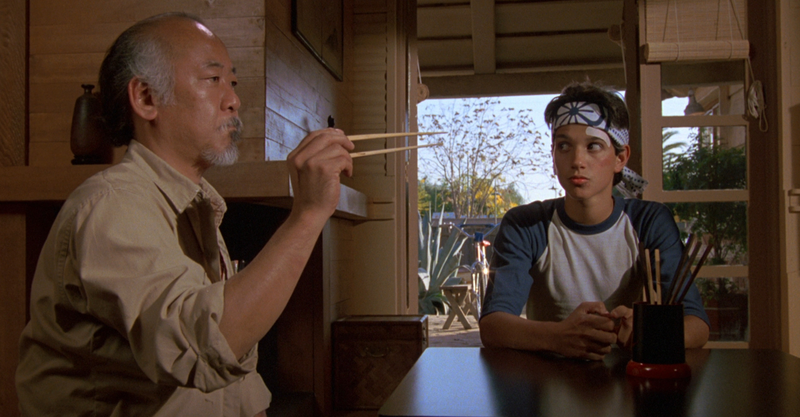 Mr. Miyagi arriving just in time to save Daniel is one of my favourite scenes in all of cinema. I remember rewinding and watching that scene a second time when watching the movie with friends back in the mid-80’s. And within that rewind moment we also rewound multiple times the moment where Miyagi kicks one of the skeleton punks in the… umm… downtown business district. I learned a great story of a woman who had many save-the-day moments. Approximately 2,500 of them, in fact. I’m quite shocked I hadn’t heard the story before this week. 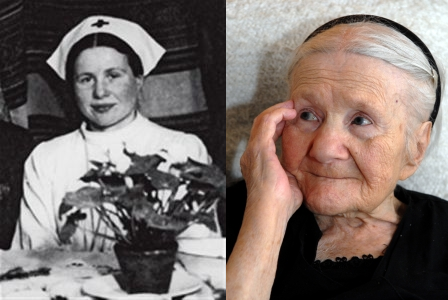 Her name was Irena Sendler, a Polish social worker who witnessed the Nazis taking control of her homeland, rounding up the Jews, and imprisoning those poor people in the “Warsaw Ghetto.” I’m sure she wished she could bulldoze her way in there and save everyone, but with an entire army in her way, she knew that wasn’t reality. If she wanted to save anyone she’d have to use wisdom and creativity: two things God has given each one of us. Typhus is a disease you don’t want to have. Fever. Chills. Nasty rash all over. Delerium. Even a coma could set in. It was well known that cases of it were discovered in the Ghetto (no surprise considering the living conditions Nazis provided their prisoners). It was also well known that the Germans didn’t want to catch it. And there it was… this fear of theirs was her way in. She would get permission to go inside the ghetto to check for signs of the disease and give treatments. And when she left, she’d smuggle out a kid or two. She might be able to drive a few out of there in an ambulance. Sometimes she had to sedate the child and pack them into a suitcase or medical kit. I became an even bigger fan of hers when I realized that she personally got 400 children out of there, and that the other estimated 2,100 were smuggled out by friends of hers whom she both enabled and inspired. So to illustrate… Competitor on the left: child-killing Nazis. Competitor on the right: Irena “Send-her-in” Sendler. 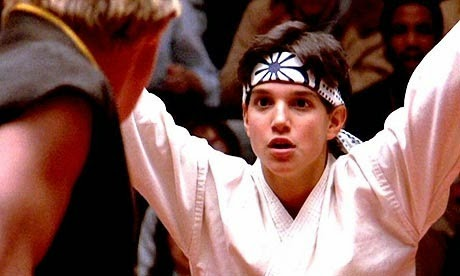 Congratulations The Karate Kid. This is your week. 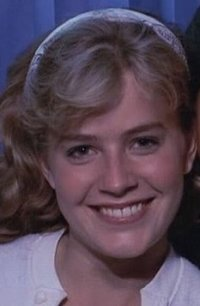 Best Actress: Elizabeth Shue as Ali in The Karate Kid, mainly because of the teen-hood crush I had on her. 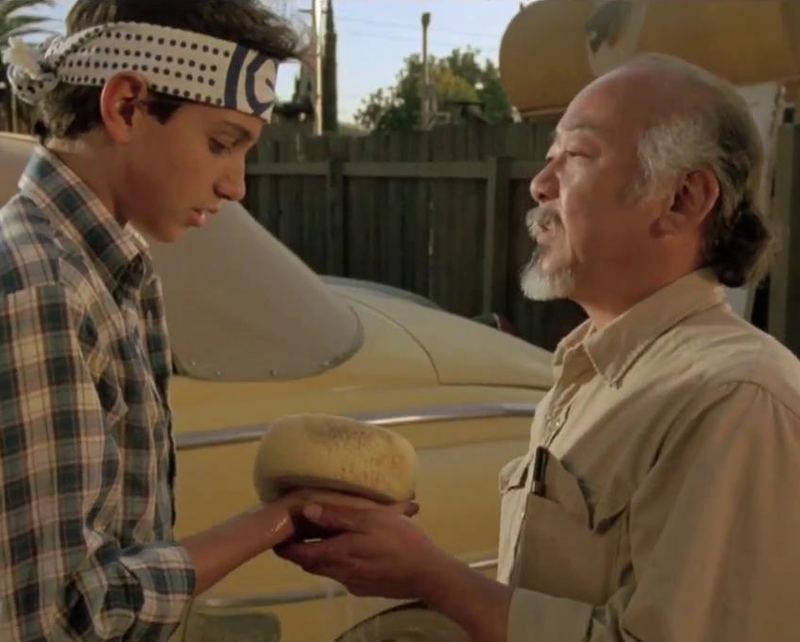 Best Actor: Pat Morita as Mr. Miyagi in The Karate Kid. After all, he got an Oscar nomination for his performance. Best Quote: “Wax on. Wax off.” See how many people you have to ask before finding one who doesn’t recognize this quote. A few final notes about Sendler. She was captured by the Nazis for her actions and tortured severely. So much so that they caused considerable damage to her legs and feet. She was also sentenced to death. But she escaped, adopted a fake name, went right back to work with her friends saving Jewish children. She died in 2008 after living a long full life. How did she escape? One of her friends bribed one of the guards to let her go. Ah, Europe. You and bribes are like peas and carrots. This month the new Ghostbusters movie is coming out. I haven’t heard much positive about it, but hopefully it will exceed expectations. The original is one of those classic 80’s movies that we all know and love, and it was released in 1984. 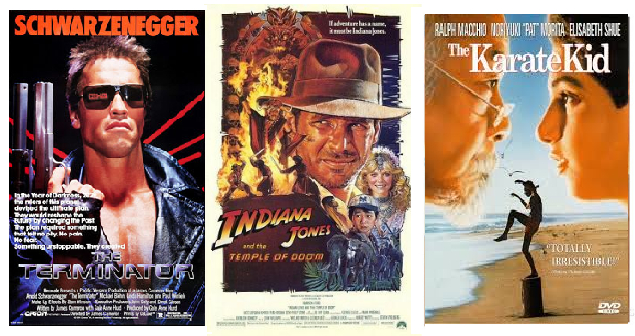 Here are three other movies released that year with the same distinction. Which one would you pick to be the movie of the week?